North Park Residences is a newly launched mixed-use commercial and residential development at Yishun Central 1 by Frasers Centrepoint Ltd (FCL). This massive plot of land, 442,234 square feet, is right beside the Northpoint shopping mall is expected to developed into a 12-storey integrated complex comprising of 920 residential units, comprising 1-5 bedroom units catering to singles as well as large families, investors and owner occupiers alike. The residential and commercial carparks are segregated. All units in North Park Residences have North-South orientation and there is a huge landscape deck of facilities, 10 Thematic Gardens, 7 main pools and 7 pavilions amidst 50 named facilities including a 50 metres lap pool, for residents to enjoy. North Park Residences will sit on top of a retail mall, bus interchange and community club. North Park Residences is planned to integrate with North Point shopping mall through a covered pedestrian promenade and link bridges, subject to the authorities’ approval. The mall, North Point City, will provide an array of amenities such as a hypermart, large foodcourt, childcare centres, library, banks, retail and service trades offering best choices of shopping and dining options at your doorsteps. 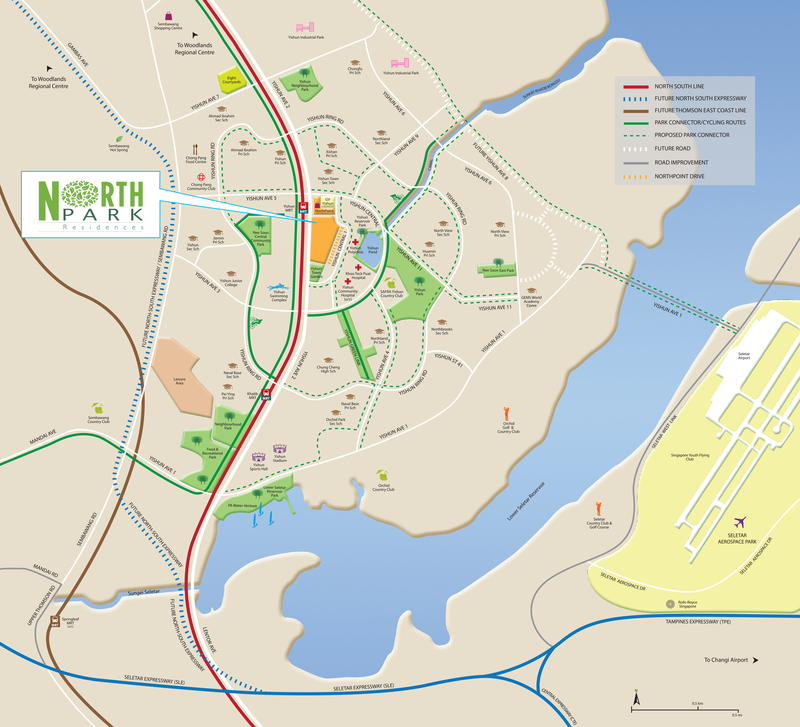 North Park Residences is located right in the heart of Yishun, close proximity to extensive choices of amenities. Strong demand for the apartments are expected, as potential buyers, especially those living in Yishun, will be drawn to the site’s locational attributes and amenities such as easy access to buses and the Yishun MRT station. Beside the convenience of having a shopping mall and bus interchange at your door steps, there are two other shopping malls North Point Shopping Centre and upcoming Junction Nine both within walking distance. There are plenty of dining options nearby or may choose to take a 3 minutes drive to the famous Chong Pang Market Food Center. Khoo Teck Puat Hospital will provide health needs. Residents can seek outdoor recreational facilities at the nearby Orchid Country Club, Seletar Country Club and Yishun Safra. With many schools nearby, such as Chongfu Primary School, Northland Primary School, Chung Cheng High School and Yishun Junior College, North Park Residences will be an ideal home for families with school-going children. There will also be no shortage of rental demand from white collars working at Woodlands Regional Centre and Seletar Regional Centre which are only a short drive away. 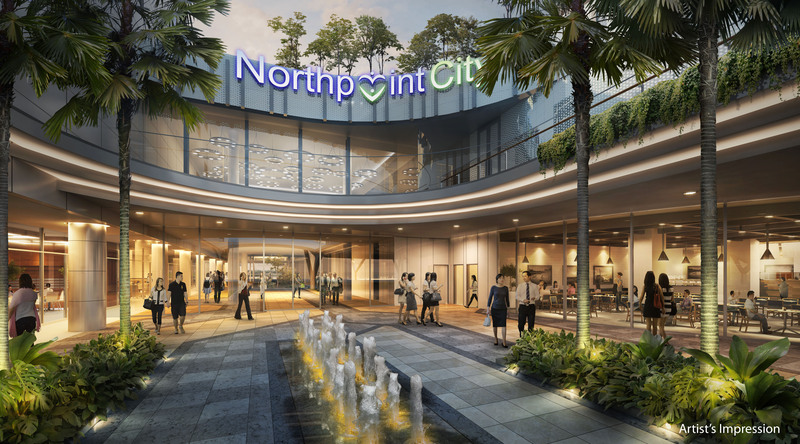 Northpoint City will be the largest shopping mall in the North of Singapore. The current Northpoint Shopping Centre will be expanded by almost 2.5 times with the numbers of retail shops and food & beverage outlets also doubled. Beside having an air-conditioned bus interchange in Northpoint City will also be the first ever shopping mall with a community club located within it. Events can be held in the 4400 sqm, open space Town Plaza, integrated to promote a vibrate community and community bonding. North Park Residences will sit atop of Northpoint City. The residential component is expected to made up of 12 blocks of 10 storey high residential buildings with a total of 920 units with full condominium facilities. The entire development is expected to complete by December 2018. Woodlands Regional Centre is one of the four regional centres identified under the Land Use Plan to create business hubs outside the city centre. This not only provides more locational choices for businesses but also brings jobs and amenities closer to homes, thus reducing the need to travel towards the city centre. With the finalization of the new Thomson MRT Line’s station location and alignment, we intend to prioritise development of the land around the Woodlands MRT interchange station to capitalise on the enhanced connectivity. As announced in the Land Use Plan, a new North Coast Innovation Corridor will be developed. Woodlands Regional Centre will anchor the development of the North Coast Innovation Corridor, which will be realised in the longer term. The Corridor extends from Woodlands Regional Centre, Sembawang, the future Seletar Regional Centre, to the learning corridor and innovative cluster at Punggol. Seletar Regional Centre has the potential to grow to two times that of the Tampines Regional Centre. Located next to it is the Seletar Aerospace Park which will provide a range of activities including training, research and development. The Seletar Regional Centre and Seletar Aerospace Park will be a major employment node for people living in the North and Northeast. Mixed residential developments usually fetch a higher price, especially in rent; such developments are sought after because of the added benefits of a mall and the price can be easily justified. For more information of North Park Residences, simply filled up your details below and our salesperson will get in contact with you shortly!